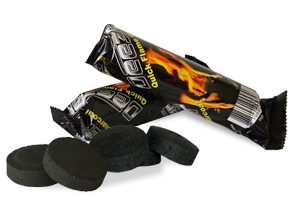 Deezer Charcoal is one of the more unique Quick Lighting Charcoal brands on the market due to its unique flame starter. Deezer Charcoal immediately creates a flame when lighting the charcoal and is recognized as the fastest quick lighting Hookah Charcoal brand available. These Charcoals are specifically designed for smoking with the Hookah, as they are odorless, as well as tasteless and do not interfere with flavor of the tobacco. Each roll of Deezer Charcoal 33mm contains ten individual charcoals.